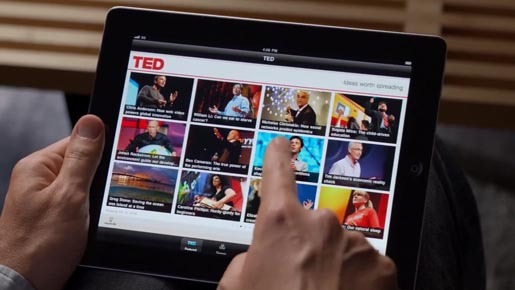 Apple is presenting the iPad 2 as the ideal way to develop a life of ongoing learning in “Learn”, a television commercial featuring Kevin Slavin’s TED talk on algorithms, calligraphy, James Joyce’s Ulysses, head and neck bones, the solar system, chess, the piano and arithmetic. Whether you want to pick up a new language or uncover a hidden talent, iPad is a great new way to learn. The Learn commercial was developed at TBWA\Media Arts Lab by chief creative officer Duncan Milner, executive creative directors Eric Grunbaum and Scott Trattner, associate creative director/art director Simon Cassels, associate creative director/copywriter Claire Morrisey, art director Vidur Raswant, copywriter Brooks Jackson, agency producers Perrin Rausch, Christopher Shaw, Tessa Kocourek. Filming was shot by director Glenn Martin via Untitled Inc, Los Angeles, with director of photography Jason McCormick. Editor was Kevin Clark at Nomad. Post production was done at D-Train by lead Flame artist Ben Gibbs.